韩桂红, 滕海涛, 高歌, 等. 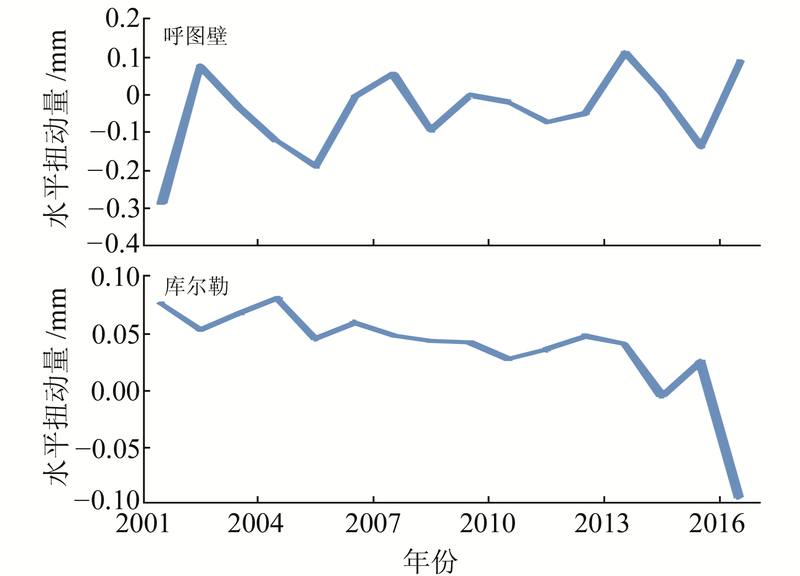 利用跨断层形变资料研究天山中段断层现今活动特征[J]. 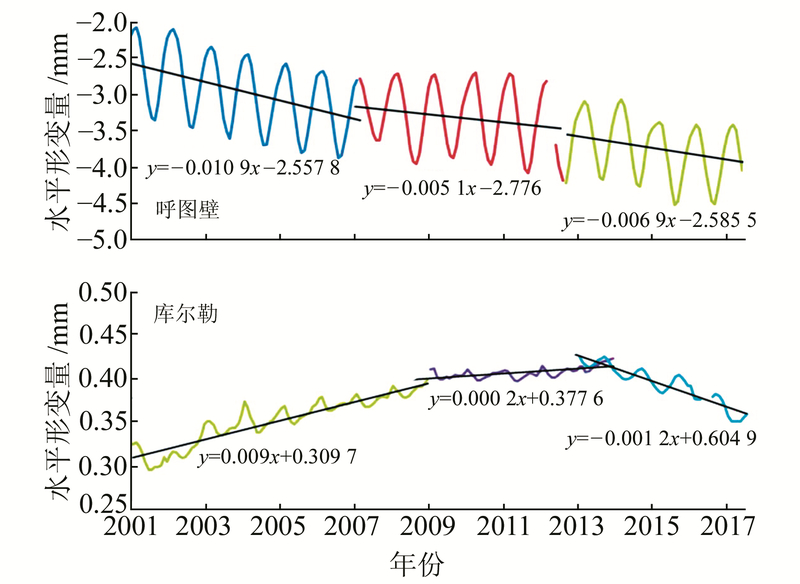 大地测量与地球动力学, 2019, 39(1): 72-76. HAN Guihong, TENG Haitao, GAO Ge, et al. Research on the Current Active Characteristics of the Middle Tianshan Fault Using Cross-Fault Deformation Data[J]. Journal of Geodesy and Geodynamics, 2019, 39(1): 72-76. National Natural Science Foundation of China, No.41672208;Earthquake Science Foundation of Xinjiang, No.201601;Youth Seismic Regime Tracking Project of CEA, No.2018010230. HAN Guihong, PhD, engineer, majors in earthquake prediction, E-mail:hanguihong618@163.com. Foundation support: National Natural Science Foundation of China, No.41672208;Earthquake Science Foundation of Xinjiang, No.201601;Youth Seismic Regime Tracking Project of CEA, No.2018010230. About the first author: HAN Guihong, PhD, engineer, majors in earthquake prediction, E-mail:hanguihong618@163.com. Abstract: Based on measurement data of multiple faults in the middle Tianshan region since 2001, the current fault characteristics are analyzed from fault movement direction and fault average velocity. The results show that the activity of the fault alternates from positive to inverse, from left to right. 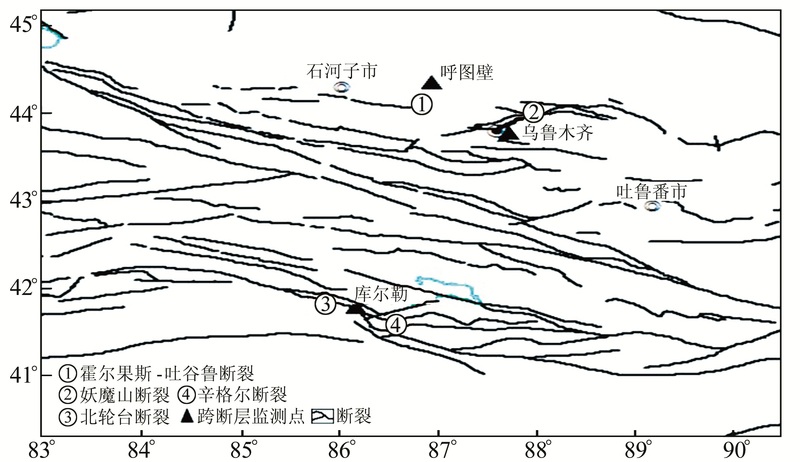 Movement characteristics of the north Bugur-Qinggir fault is right, the activity is inverse. The activity of the F2 fault of Yamarik hill is inverse. The activity is highest in the F2 fault of Yamarik hill, and the Khorgos-Manas-Tugulu fault is the lowest in activity degree. The Khorgos-Manas-Tugulu fault, the north Bugur-Qinggir fault, and the F2 fault of the demon mountain are all in the vertical direction, and the first two horizontal directions are in the squeeze state. The time course of the fault activity rate has a stage characteristic, and the turning points of the fault have a good match in different periods.